Winona LaDuke, an environmentalist, political activist, author, and farmer, wants to “make American great again.” Her idea of when America was great? “When there were 8,000 varieties of corn,” she said. LaDuke was the keynote speaker at the Community Food Systems Conference held December 5-7 in Boston. About 500 people attended the conference, organized by the New Entry Sustainable Farming Project at Tufts, to delve into issues surrounding food security, social justice, and sustainable agriculture. They came to talk about sustainable supply chains, the farm bill, farm-to-school programs, farm workers’ rights, access to organic foods, and urban food deserts. 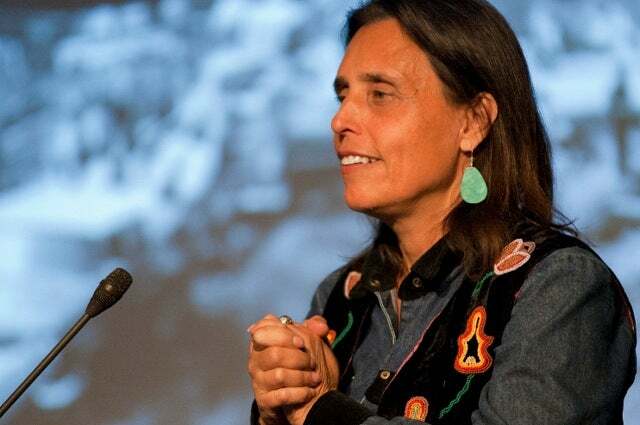 LaDuke, a member of the Anishinaabe nation, is a long-time advocate for native economic and environmental development. She twice ran for vice president on the Green Party ticket with Ralph Nader. In recent years, she has spent most of her time fighting oil pipeline proposals in Minnesota. But at this conference, she spoke as a farmer and food advocate. “You are the people who are going to feed us all,” LaDuke told the crowd. And that, she said, will only happen if we stop pillaging our natural resources, turn away from fossil fuels, and commit to preserving variety in the crops we grow.